More than 55,000 people die each year from rabies, the most common source is from the un-vaccinated pet population, as they are our link to wildlife. The source of rabies to humans can be eliminated through ensuring proper vaccinations for out pets, education, and proper medical care. Rabies is a virus, typically spread by an infected animal biting another animal or human, that affects the nervous systems of mammals. Once symptoms appear rabies is not treatable and is always fatal. 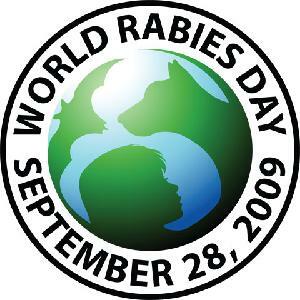 In 2008, 2 rabies cases were confirmed in Olmsted county and surrounding counties. The most common symptom is behavioral change, like:staggering, circling, are unusually tame or aggressive, fearful, agitated, or depressed, they may have rabies. If you suspect an animal of rabies, do not touch them, seek advice from your veterinarian or animal control office. To reduce human exposure ALL dogs, cats, ferrets, horses and valuable livestock should be vaccinated for rabies, EVEN indoor only companions, and those at petting zoos and fairs. Proper vaccination includes 2 initial yearly vaccines and boosters as required by local ordinances, typically every 1-3 years. Due to proper vaccination of our companion animals, rabies prevalence has declined over the past 20 years, BUT is not eradicated. Don't feed, touch, attract, or approach wild animals. Tightly cover all garbage cans and keep garbage and food picked up. Report stray dogs, cats or animals displaying unusual behavior to the local animal control. Teach children to stay away from strange animals and encourage them to tell an adult if they have been bitten. Thoroughly wash the wound with large amounts of soap and running water immediately. Look at animal, taking in a description of it. If it is a companion animal, get the owners name, address, phone number, and vaccination status of the animal. Wild animals that bite humans should be sacrificed and tested for rabies, call the local animal control for help capturing the animal. Seek medical attention immediately. Your doctor will evaluate the need for a variety of vaccinations. If your pet is bitten, call your veterinarian as they will need a booster vaccination for rabies. Rabies vaccination is required for all dogs and cats including indoor only pets. It is highly recommended to vaccinate ferrets, horses and livestock.